When Jesus, the Son of God died on the cross and was buried, Satan and his fallen angels thought they had won a great victory. They were very mistaken! On the third day, after Jesus was crucified and buried, Jesus rose from the dead, victorious over Satan and his followers. Let us see exactly what happened. The Lord Jesus died about three o'clock in the afternoon. A rich man named Joseph asked for the body of Jesus. 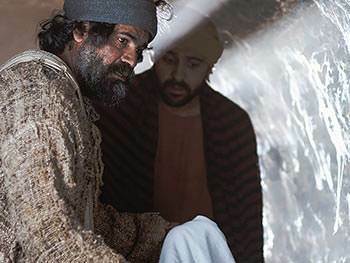 Joseph and another disciple prepared Jesus' body for burial. His body was wrapped in many yards of linen cloth. 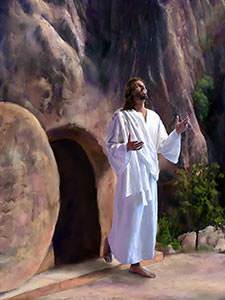 Jesus' body was placed in a new tomb which had been carved out of solid rock. A large stone was rolled against the opening of the tomb. Roman soldiers were assigned to guard the tomb. 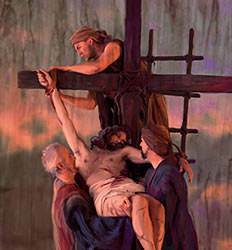 The body of Jesus lay in the tomb three days and three nights. On the third day, before daylight, the Lord Jesus rose from the dead, victorious over Satan and all the powers of darkness! Shortly after this, three women came to the tomb of Jesus. They wanted to put sweet-smelling spices on His body. 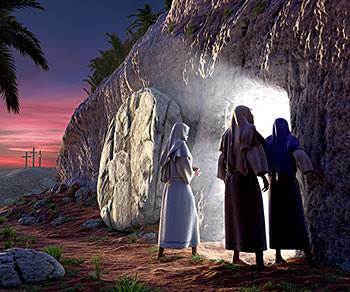 When they got to the tomb, they found that the stone had been rolled away. The three women were very excited. They ran back to tell the disciples. They met Peter and John and told them what they had seen. Peter and John ran to the tomb. John out ran Peter and got to the tomb first, but he stopped outside. 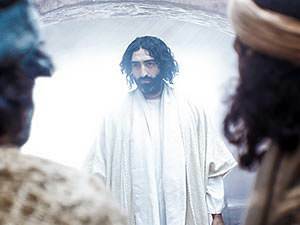 When Peter came, he went right into the tomb and John followed him. When Peter and John looked around inside the tomb, they saw a strange sight. The grave clothes were still there, in the form of a man's body. 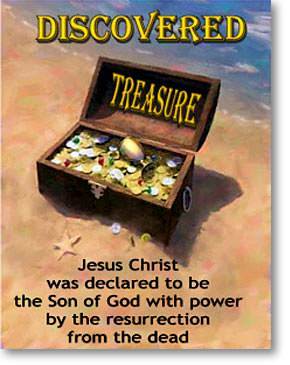 They had not been unwrapped, but the body of Jesus was not there. Jesus had risen from the dead! Soon one of the women named Mary Magdalene came back to the tomb. She thought that someone had stolen the body of Jesus. She was crying because she loved Jesus so much. Suddenly Jesus stood near her. She thought He was the gardener. She said, "Sir tell me where they have taken His body." That night ten of the disciples were in the upper room. Thomas was not there. The disciples had met together to talk about what they had heard and seen. Suddenly, Jesus appeared to them and said, "Peace be with you." They were afraid. They thought He was a spirit or a ghost. But Jesus said, "Don't be afraid. I am not a spirit. Touch My hands and My feet and see that it is I Myself." Then Jesus sat down and ate fish and honey with them. Later, when the disciples saw Thomas, they said, "Thomas, we've seen Jesus! He is risen!" But Thomas did not believe them. "Except I see in His hands the print of the nails, and put my finger into the print of the nails, and thrust my hand into His side, I will not believe." Eight days later, the disciples were again in the upper room. This time Thomas was with them. Suddenly Jesus appeared to them again and said, "Peace be unto you." Jesus turned to Thomas and said, "Thomas, behold My hands. Put your finger in the nail prints. Put your hand in the spear wound in My side! Don't doubt any longer. Believe!" 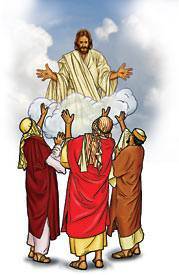 Then one day Jesus blessed His disciples and as they watched, He went up, up, up into the sky. The disciples watched Him until a cloud hid Him from their sight. 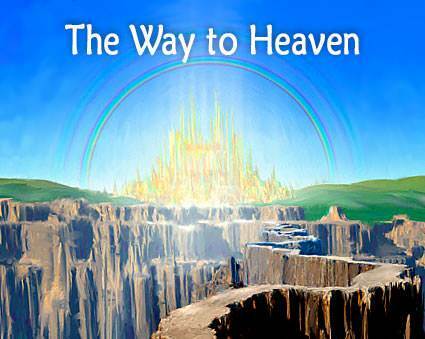 The Bible tells us that, when Jesus returned to Heaven, God the Father gave Him the place of greatest honor. He set the Lord Jesus at His own right hand. He made Jesus Lord of all! The Bible says that God has put "all things under His feet." This means that every creature is under Jesus' authority. 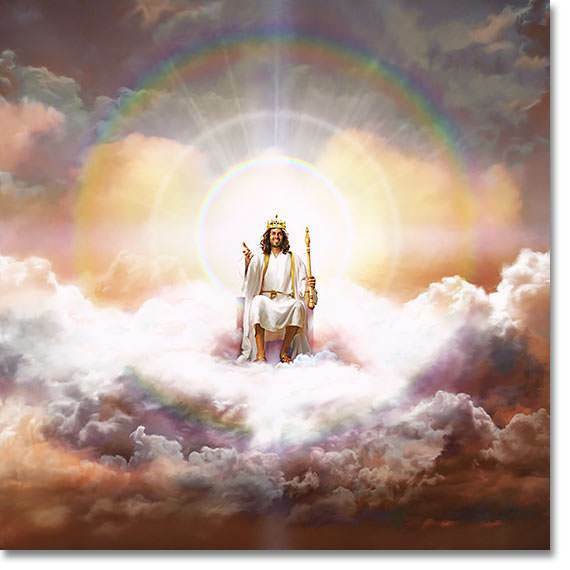 Jesus Christ has all power in Heaven and in the earth. God the Father has not only made Jesus Christ to be Lord of all, but He has also made Him to be the Head of a new family. This new family is called "the children of God." Now there are two families in the world. Each of these families has a head. 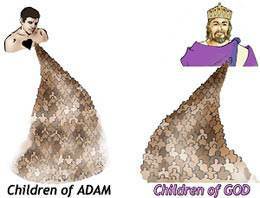 Adam is the head of the sinful face which he produced, and Jesus Christ is the Head of the new family called the children of God. Each one of us, when we were born, became a member of Adam's sinful face. Not a single person in Adam's sinful family is acceptable in God's sight. Not one person in Adam's family has met God's standard. What does it mean to be "born again"? 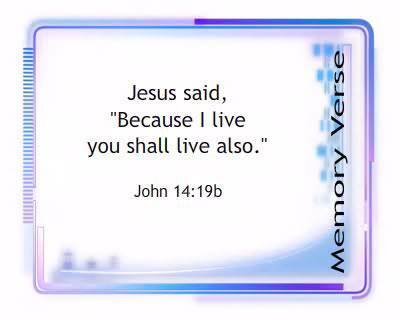 It means to be born into God's family by a spiritual re-birth. We cannot be born again physically, but we can be born again spiritually. In the next two lessons we are going to see how we can be "born again" into the family of God.